Many skiers know that the Great Salt Lake to the west of my current home in Ogden, Utah is a world famous powder snow making machine. Lake-effect snow is a weather phenomenon in which a large body of water works in relation with cold air to create moisture and thus snow in the winter months. However, many people don't know that the same "lake-effect" takes place way up north in the midwest of America on an obscure peninsula off the top of another peninsula. On the northern shore of the Upper Peninsula (U.P.) of Michigan is another peninsula called the Keeweenaw Peninsula, which juts out into the middle of the Great Lake Superior. Storms come across Canada slamming into the Great Lake and then swell up until they cross over that obscure peninsula dumping gobs of the moisture gained while crossing the lake as light and cold midwest powder. Upwards of 300 inches of cold dry snow is pumped out of this midwest powder machine each winter. 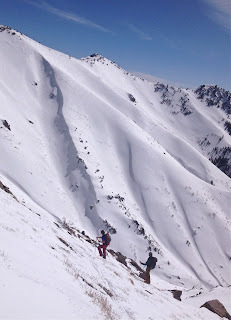 Frigid cold temperatures can make the skiing conditions hit or miss to a certain degree, and I have certainly missed the good snow in passed years, but this was not one of those years. ^As I mentioned in my last post here I was not home from Japan very long before I had to pack up again to get back on the move flying across the country. The U.P. of Michigan was my destination. 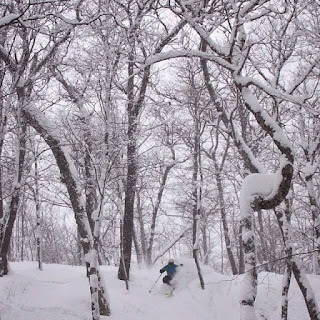 I go up there often for the Midwest Telefest, but also to ski at one of my favorite places, Mount Bohemia. Mount Bohemia is located on the tip of the Keeweenaw Peninsula off the northern shore of the U.P. of Michigan. With 900 vertical feet of steep rocky glades and 300 inches of snow each winter Mount Bohemia can rival many western ski resorts for terrain and snowfall. The midwest culture and unique operation at Mount Bohemia are like no where else on earth, and I have skied all over this planet. ^My Dad ventured north from our hometown in Wilmot, Wisconsin and picked me up in the capital city, Madison. We drove further north across the Wisconsin border to the north into the U.P. of Michigan. The storm had set in extending our long drive by hours. As we approached Mount Bohemia way out on the tip of the Keeweenaw we lost cell phone reception as well as any resemblance of the road. We laughed that we were driving "fresh tracks" all the way through the U.P. of Michigan. As you can imagine, we got the tires loose a few times helping to serve to keep us awake as our hearts were pumping really heavy with each sliding scare. The lake-effect midwest powder machine was pumping hard, and the tough driving could not dampen our stoke! ^A bunch of my cousins and friends from Wisconsin were already there when we arrived. At night in one of the two bars near Mount Bohemia, the Bear Belly, and we were all stoked to be able to hang out with each other. In the pic above my cousins, Jamie and Jeremy, and our friend, Adam, listen closely to another of my Dad's classic stories. My Dad is great storyteller. We all often find ourselves leaning into him over a cold beer sucked into one of his tall tales. Be it a garage in southeast Wisconsin, or a dive bar in the U.P. of Michigan, we sit around talking smack like this every time we all get together. The whole jubilant scene is fueled by my twin cousin's infectious laughter resonating throughout the room in perfect harmony as only a pair of twins can. Most of my childhood I could barley tell them apart from each other. This is my favorite part of my annual midwest skiing sabbatical, seeing and skiing with my family. I have skied all over the planet with many of the best skiers the world has to offer, but skiing with my kin in a unique midwestern setting with unique midwestern snowfall is all-time in my book. ^Mount Bohemia… one of a kind. ^My sledneck cousins fell in love with Mount Bohemia last winter when they where up here helping me with snowmobile access to some backcountry skiing in the Porcupine Mountains a few hours to the southwest. After I left the Porcupines they drove up to Mount Bohemia to ski it. They were totally blown away. Getting them back up there again this year was an easy sell. They left the snowmobiles in southeast Wisconsin and brought up some new fat skis this year. Perfect timing too, because the lake-effect machine was pumping a lot of snow onto Mount Bohemia and the boys were stoked with the new fat skis! ^This row of mailboxes is somewhat iconic at Mount Bohemia now as it marks a popular exit from the ski terrain to get a pick-up from the bus back to the base area. The 12-inches of snow on top is also a good metric for the week we were having there. ^This pic that Joey Wallis snapped of me in the majestic glades of Mount Bohemia is also a good metric too. Midwest powder machine! Full bore! ^The midwest powder machine was chugging a few hours to the southwest as well in the Porcupine Mountains. The Porkies ski resort is open there on weekends, and is home to Midwest Telefest. I have been going there for years and it is always a really good time. Half our crew went back down south to our Wisconsin home town while my Dad and I headed over to the festival with my Dad's cousin Tom and his son Alex. As usual all of the midwest's finest telemark ski bums showed up. It is always so good to see them all. It is even better when we have a foot of new snow to celebrate with. 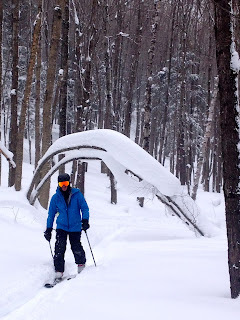 ^The Porkies is home to some fantastic old growth forest tree skiing. The shores of Lake Superior just steps away from the bottom of the chair lift makes for another lake-effect scenario. The storm track does not favor the Porkies quite as well as Mount Bohemia, but when your talking about a foot versus eighteen inches who is really counting. Not me. 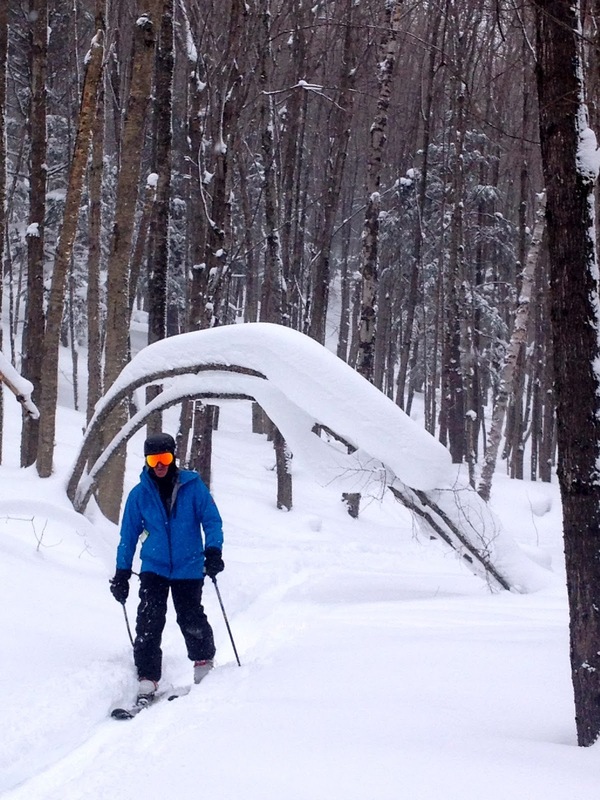 Not my Dad as he treks his way under a double arch of snowy goodness either. Double powder arches are much better for ya then the double golden arches of fast food goodness, which I typically have no problem eating although I much prefer gorging on powder over a Big Mac. There was no shortage of powder, and the festival potluck dinner was much better then some fried chicken nuggets. Good snow, good food, good music, and even better people is what Midwest Telefest is all about. It is what this telemark community we know and love so well is all about. That never falls short on me. Sharing this life I love on snow with my Dad, my cousins, and my friends does not fall short on me either. At one point as my Dad and I packed up and drove out of town early Sunday morning with the sun rising over the cold frozen road ahead of us I looked over at him in the passenger's seat next to me and said, "Gosh Dad, Japan a couple weeks ago in hip deep Hokkaido powder, the midwest powder machine going full bore on us in the U.P of Michigan… we are kind of winning right now aren't we?" He took a long slow sip from his coffee cup, turned to me with a slight smile like he knew something I didn't, and then agreed, "We certainly are, son. We certainly are."